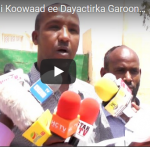 The minister of labor and social services Mrs.Hinda Jama Hirsi (Gaani) speaking to reporters in at après conference she called revealed the deliberations from a national youths employment conference that had just concluded in Hargeisa. 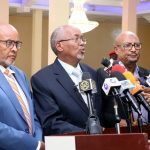 The minister was flanked by top officials of Somaliland Youth Organization also known as (SONYO) and Save the Children. The labor and social services minister confirmed the importance of the youth employment conference. She went on to state that it is the policy of president of Somaliland H.E Musa Bihi Abdi to create jobs for the youths, adding that the head of a state had ordered the creation of a youth’s fund to help empower them economically. The ministry is in the process of holding census for expatriates working in the country. It was decided that a job that can be done by a local should not be given to a foreigner. Thew ministry of labor and social services plan to draw policies that give priority to youth in employment opportunities. There should be a working relationship between the ministry of labor and companies, businesses and organizations so that job creation could be encouraged. The ministry of labor and the SONYO after a lot of soul searching decided that the ministry of education should add in the curriculum of education skill that a ready available in the country they should promote local employment opportunities. The mobilization of Somaliland Job market to promote youth employment in thecountry. To promote youths to participate in improving and benefiting in natural resources industries such as mining, fishing, farming, livestock rearing and so forth. The ministry of labor will also hold a census for privately employed workers to ascertain the extent of joblessness in Somaliland.